Fans of Taeyeon have much to look forward to next year, as the Girls’ Generation member just revealed details of her upcoming solo concert in Singapore in January! Because a five-song set at HallyuPopFest just wasn’t enough to please our SONE hearts, we couldn’t be happier that the K-pop goddess will be making her way back for a full-scale concert. Set to take place at Singapore Expo on 12 January, get ready to belt out to crowd-favourite tracks like ’11:11′ and ‘Fine’, along with fresh tunes from her latest solo record Something New. Tickets will go on sale 1 December, 10am via SISTIC. There will also be a pre-sale for IMC Live Global Fans on 30 November, 10am for those who signed up here before 29 November, 3pm. Barely four months after his whirlwind visit to Singapore to promote Thai film Brother of the Year, the ever-so-hardworking Nichkhun made his way back to our humble shores for his newest project, Wok The World. A new tvN production in partnership with Viu, the up-and-coming series sees Nichkhun, along with Michelin 3-starred chef Alvin Leung and MasterChef Canada Season 1 winner Eric Chong, embarking on a gastronomic adventure around the world to discover local delicacies. Their first stop? Our very own Resorts World Sentosa, where the trio were tasked to recreate our traditional Lo Hei Yu Sheng and Bak Kut Teh for their debut episode. In between their shooting schedules, we caught up with the 2PM heartthrob to grill him on everything and anything food – from his favourite local dish, to his ultimate guilty pleasure. Along the way, we also found out that the 30-year-old is rather modest about his cooking skills, because he “always cooks and eats alone” (awww). Hey Nichkhun, you can cook for us anytime. Catch Nichkhun in tvN’s latest original production Wok The World, premiering on tvN in Asia and Viu Singapore from 26 November (every Monday) at 10.30pm. Lee Junho On His Most Memorable Career Moment: "Being Part Of 2PM Is My Best Memory"
Known as one of the most famous K-lifestyle festivals, the Korean Brand & Entertainment Expo 2018 (KBEE 2018) opened to throngs of fans waiting to discover new Korean brands as well as meet their favourite K-pop idols. 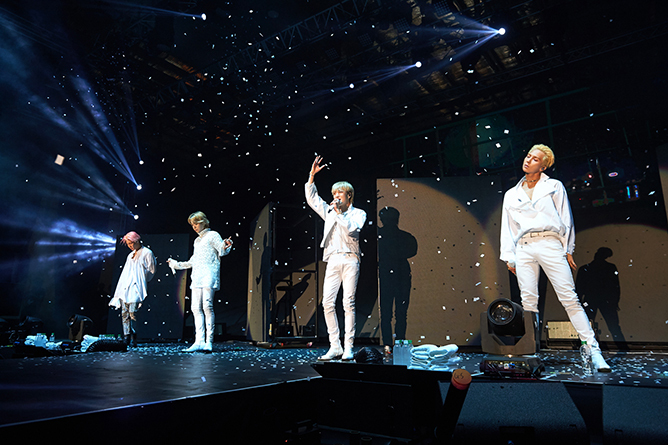 Held on 1 and 2 November at the Marina Bay Sands Expo & Convention Centre, it was two days of Hallyu goodness at KBEE 2018. 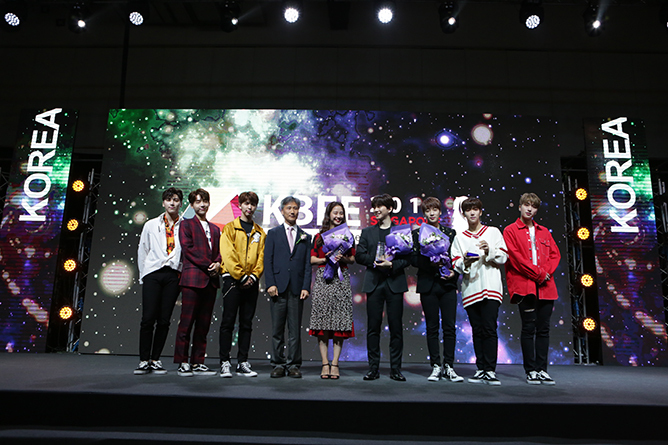 Not only were fans able to get upclose and personal with Honourary Ambassadors 2PM’s Lee Junho, Song Ji Hyo, SNUPER and Boy Story at their respective fan events, attendees were also treated to thrilling performances by the various artistes during the opening ceremony. Amidst the flurry of events, we also managed to catch up with K-heartthrob Junho to talk about his cooking skills, his best 2PM memories and his upcoming plans for 2019. Read on for his full interview. Hi Junho, welcome back to Singapore! It’s been 10 years since you’ve broke out into the industry, what’s the biggest lesson you’ve learnt as an artiste? There’s this quote that I’ve always heard from Jun.K and it goes, “You are passionate in your heart and very rational in your head”. As I feel like I’m still learning as I go along, I think it’s very important to be led by your heart with passion but at the same time think rationally to make hard decisions. You’ve have taken on various roles since making your acting debut. Which has been your favourite so far? I like everything (laughs). I’ve acted in about seven dramas so far and every moment was very memorable for me. Particularly, [I remember] coming to Singapore to promote for this movie called Cold Eyes back in 2013. Although my character wasn’t one that appeared much in the film, I felt that it was still a very significant role as he played a part in creating tension amongst the characters. It was also my first ever on-screen performance and I view it as a piece that brought me a lot of good luck. You’ve acted with a lot of notable actors through the years. Are there any actors whom you would like to work with in the future? I was very lucky in a way. I’ve worked with a lot of wonderful sunbaes from the start and I felt that I’ve gained a lot from this experience. During filming, I learn a lot from different people on set, so as long as I can meet a fellow actor whom I can learn from, it would mean a lot to me. You played a chef in Wok of Love that debuted onscreen earlier this year. We’re curious – did you have to attend cooking classes for the role? Yes, I had to attend classes for about a month where I learned how to cut vegetables the right way and picked up other cooking techniques. That’s where I learned how to use the wok as well. Do you find yourself cooking more now that you’re equipped with the skill? The essence imparted from the wok is very important. But when I’m at home, I don’t have all the things to cook with the wok so I wouldn’t really put the skills I’ve learnt to good use outside of the set. I feel that I make pretty decent food with the wok and although I haven’t had a chance to cook for my family yet, I hope to do so someday. What’s one dish that you will never get sick of? Stir-Fried Kimchi Rice. I really like fried rice, but I like the fact that there’s kimchi inside as well. It’s one of my favourite dishes! Two years ago, you were in a drama called Memory. What’s the best memory you’ve had in your career? Being part of 2PM is my best memory. It’s also the best thing I’ve ever done. As we’re nearing the end of the year, what are some of your New Year resolutions for 2019? To always be healthy, and to continue to being in contact with my fans. If you could give the other 2PM members a New Year’s resolution you want each of them to fulfill, what would it be? For Taecyeon, I would want him to constantly work hard as he has just returned from the army. For Jun.K and Wooyoung, don’t be sick. For Chansung and myself, it’s to stay strong. As for Nichkhun, I would also want him to constantly work hard at what he’s doing… because he would be the only one left after the rest of us enlist in the army, so I’d want him to continue spreading the fame of 2PM by himself (laughs). Thanks to KBEE Singapore for the interview opportunity with 2PM’s Lee Junho! If you thought WINNER’s concert was lit, you’re absolutely right – but leave it to iKON to bring the atmosphere to a new high at their 2018 Continue Tour in Singapore. Staging their sophomore concert at the Max Pavilion right after their YG labelmates, the seven-member K-pop outfit delivered a high-octane set packed with solid live performances, rousing solo stages, and of course, a ridiculous amount of highly-entertaining banter in true iKON fashion. Similar to WINNER, iKON took charge of the dialogues without the presence of a translator, keeping the crowd in fits of laughter with their witty comments and side-splitting antics throughout the two-hour showcase. We recap some of the funniest moments of the night. #1 Oh, nothing much – just Jinhwan being jinhwan. Taking a breather after performing a string of high-energy tracks such as ‘Bling Bling’, ‘Sinosijak and ‘Rhythm Ta’, the boys took some time to catch up with SG iKONICs. While the other members were busy talking about their love for chilli crab and wanting to visit Sentosa, Jinhwan casually added that “Singapore is my city. It’s so fresh and clean, just like me!”, which drew a chorus of mock disapproval from the members. Look at their hilarious reaction below! #2 A moment of silience for Double B… literally. While the vocal line went backstage to prepare for their next performance, Bobby and B.I took over the mics to keep the crowd entertained. They did everything they could to stall the time – from initiating a ‘Love Scenario’ sing-off, to an aegyo battle (which was clearly not the rap duo’s forte as they outrightly declared they’re not “aegyo people”) – but their members were still not ready. Running out of topics to talk about, they were left with no choice but to stare at the audience in silence. “We don’t know what to do anymore!” an exasperated Bobby cried out. Fortunately, the vocal team swooped in to save the poor lads a couple of seconds later. #3 Yunhyeong and Jinhwan being savage towards each other. “Who’s the most handsome?” Bobby asked the crowd, which led to a playful exchange between Yunhyeong and Jinhwan as the former claimed that his “face is better than Jinhwan’s”. Not one to let a shade-throwing opportunity slip by, Jinhwan proceeded to take a swipe at the vocalist: “Well, you should work harder on your face because Chanwoo’s is better!” Oh, burn. #4 A wild Bobby on the loose! Fans went hysterical when Bobby appeared in a super adorable sea lion onesie (a character from League of Legends named Urf) during ‘Best Friend’. Check out his cool breakdancing and twerking moves! #5 So… who’s gonna protect who? iKONICs’ fan project was a huge success! During the encore, fans were holding up banners that read “We’ll protect iKON’ which successfully caught the members’ attention. “No, we will protect you,” a particular smol angel by the name of Jinhwan commented, while our almighty leader B.I timidly added in, “Please protect me”. Aww… let’s just all protect one another, shall we? We couldn’t think of a more heart-fluttering way to end off the night. What was your favourite moment during #iKONTINUEinSG? Tell us in the comments below, iKONICS! K-pop boy band WINNER is a winner in many ways, but what really won over the crowd during their Everywhere Tour in Singapore, was their ability to connect with their beloved Inner Circles (or rather, SingerCircles – newly-dubbed by Seunghoon and made Instagram-official by leader Seungyoon). Very few K-pop acts could stage a full-length concert sans a translator onsite, but WINNER proved that there’s no such thing as a language barrier in their dictionary as the talented quartet – mainly Seungyoon – bantered their way through the two-hour show without any serious lost-in-translation moments. “The title of our tour is called ‘Everywhere’, isn’t it?” Seungyoon addressed the crowd in textbook-perfect English no less. “It’s named based on our desire to go everywhere in the world where our fans are waiting for us. We want to experience difference cultures and make special memories with Inner Circles.” And boy, was it a memorable one indeed. For those who weren’t able to join in the fun last weekend, here are some of the standout highlights of the night. “I think we need a bit of love for the next song,” the members hinted for ‘Love Me Love Me’, to which Seunghoon took it quite literally and swiftly planted a smooch on Mino’s cheek. “That is love!” the former exclaimed with a cheeky grin, much to Mino’s surprise as he stood frozen at his spot. Ah, don’t we all just love bromance? Mino knows exactly what fans want – but he ain’t gonna give it to y’all that easily. Things got rather steamy during his solo stages of ‘BODY’ and ‘Turn Off The Light’, which saw the rapper unbuttoning his jacket to reveal his chiselled abs at one point. Such a tease! During their Malaysia and Bangkok stops, Seungyoon performed John Legend’s ‘All Of Me’ and Ariana Grande’s ‘My Everything’ for his solo stage. For Singapore, he decided to go with an acapella of Troye Sivan’s ‘Youth’ (and if you actually search up the lyrics, all the songs he has chosen can be seen as song dedications to fans – how sweet is that?). “It’s my first time performing this song so I felt nervous and forgot some of the lyrics,” he admitted bashfully, but fans were super supportive and cheered him on. You did great, Seungyoon! #5 Can we talk about the BIGBANG tributes by Jinwoo and Seunghoon? We all know that WINNER is highly respectful towards BIGBANG, and they certainly did their sunbaes justice during Jinwoo and Seunghoon’s solo stages – with Jinwoo showcasing his mesmerising vocals with a sentimental rendition of G-Dragon’s ‘Untitled, 2014’, followed by Seunghoon channeling serious rocker vibes with an electrifying performance of ‘Taeyang’s ‘Ringa Linga’. Our VIP hearts are satisfied. While waiting for WINNER to return for the encore, Inner Circles sang along to ‘Movie Star’, held up banners and those at the seated section were tasked to form a ‘W’ using flashlights. It was a heartwarming sight – but something seemed to have went wrong along the way for the ‘W’ project, causing the members to playfully comment on the ambiguously-shaped alphabet. “Is that supposed to be a W?” Seungyoon quipped, but appreciated the gesture nonetheless and proceeded to gather the other members for a group photo. Oh, it sure was, Seungyoon. Were you there during WINNER’s concert in Singapore? Tell us what was your favourite moment of the night!